Cat Tales and Paper Trails: Technique Junkies September Release Blog Hop! Technique Junkies September Release Blog Hop! Welcome to the Technique Junkies September Release Blog Hop! September is a very exciting month as "its beginning to look a lot like Christmas!" around here! I love Christmas, and all the excitement and generous spirit involved! And lets talk a bit about generous spirit, shall we? Not only are all 21 (yes, twenty-one!) 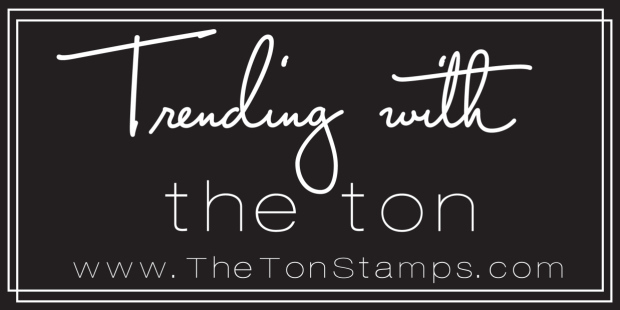 of the new September stamps 15% off through September 8th, there are some amazing blog hop prizes up for grabs this month. 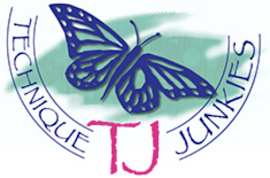 Technique Junkies is giving away 2 (yes, two) $100 Technique Junkies gift certificates as blog hop prizes this month. To enter, all you have to do is to comment on one of the hop blogs. You may comment on ALL the blogs to get multiple entries. Two lucky gift card winners will be chosen from the list of commenters on September 5th. How cool is that?!? 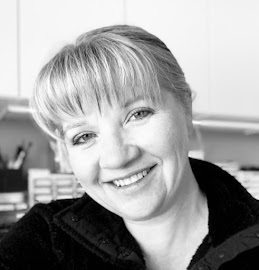 And... we also have a special guest designer joining the blog hop this month! Lydia Fiedler is joining us this month to help kick off this fun release! How sweet is that little cat's face? I love him. This Christmas Kitty was stamped in Memento Tuxedo Black ink and I added just a bit of coloring with Copic markers. He looks so sweet peeking out of that frame. 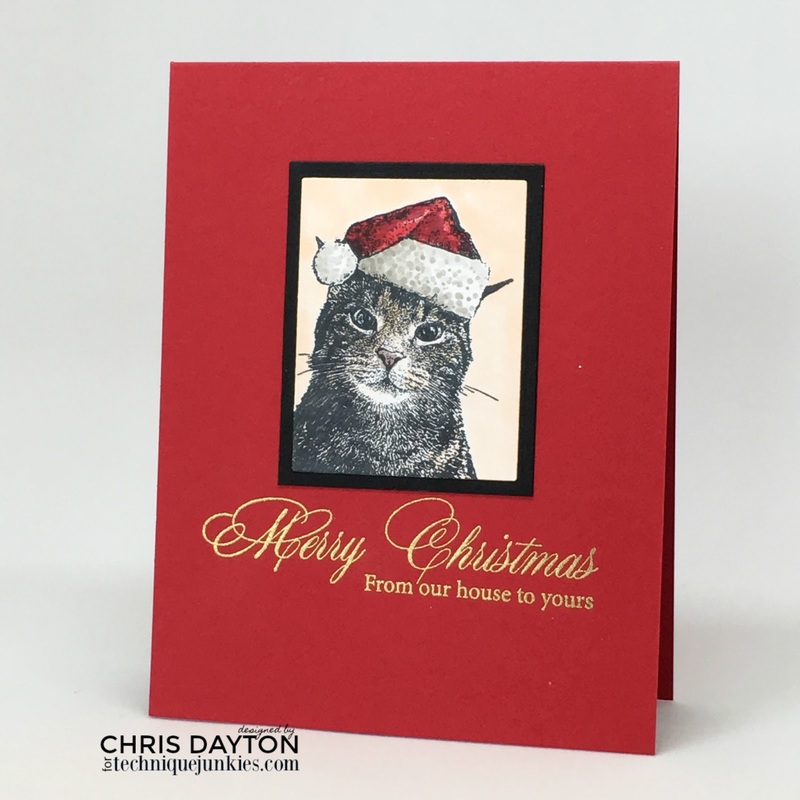 The beautiful greeting is one of a set of five greetings from the Gifts of Christmas sentiment set is heat embossed in gold. This is a card that is easy to mass produce! Here's another simple one to mass produce for your holiday cards! I stamped the Santa in Moonlight and Good Night greeting simultaneously with my MISTI on a 4"x 4" piece of charcoal gray cardstock using Versamark ink. I heat embossed in silver, then used a small brush (an inexpensive small makeup eye shadow smudge brush, actually) to lightly brush in white pigment ink into the moon. I added stars with Copic Opaque White and a silicone tipped stylus tool. 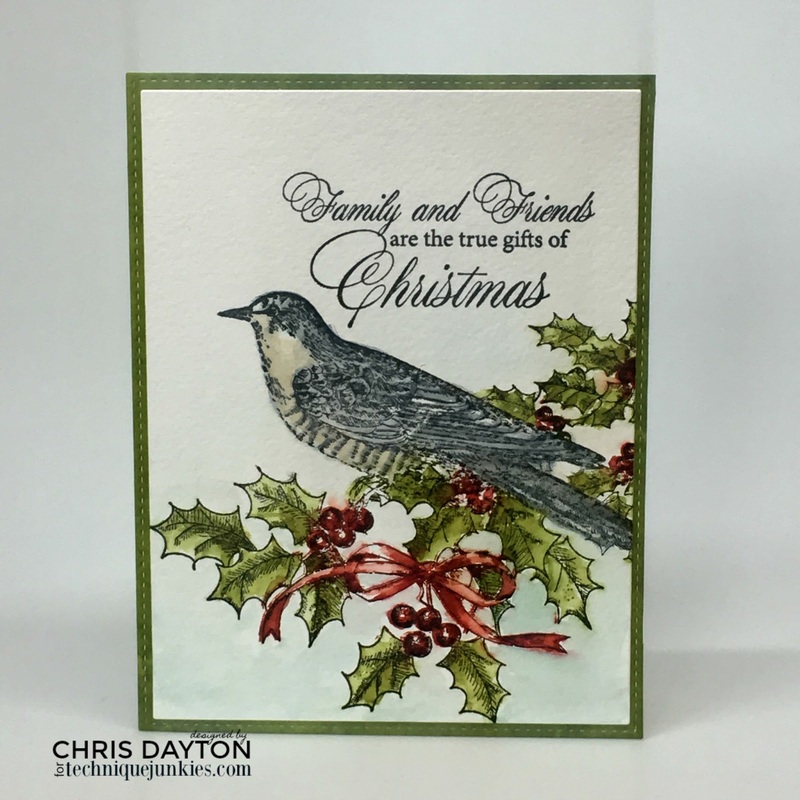 This card pairs the beautifully rendered Holly Bird stamp with another of the gorgeous scripty greetings from Gifts of Christmas. This was stamped with Versafine ink on watercolor paper and painted using Zig Clean Color Real Brush markers. Not quite ready for Christmas? How about a versatile background stamp? This is a simple friendship card, created by stamping the Star Collage background stamp in a rose colored hybrid ink onto patterned paper. I love the tiny print of the paper peeking through the distressed look of the stamp. I added a stitched circle die cut offset on the card front to add the Being You greeting. 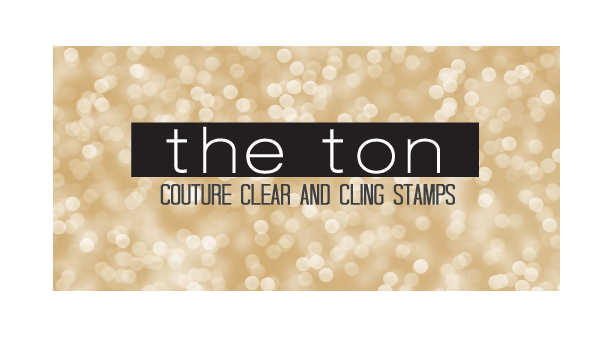 You can click HERE to see all of the amazing new September Release stamps at Technique Junkies. The new release stamps are all 15% off until September 8th. And feel free to use the code TJ10Chris to save 10% on the rest of your full priced items in your cart. Make sure you leave comments along the hop for chances to win one of the fabulous blog hop prizes. Your next stop on today's hop is the very talented Pat Huntoon! Have a fabulous day, and happy hopping! OMG love that kitty stamp! Love your cards Chris especially the night time sky and the cat. Very nice. I just love the bird and stars card, so beautiful! Such beautiful cards, by far my favorite is the black and white Santa. Thank you for sharing. As always beautiful!! Beautiful cards thank you for sharing!! Wow love the Holly Bird the coloring is just right! Thank you for these great cards. Oh my gosh, Chris! I simply can't choose a favorite - I love each of these beautiful creations! I'm really liking this new release! love that dark take on the sleigh in the sky, very cool. love the others, too! However were you able to reproduce an exact replica of my cat? The Copic marker colors you chose made the resemblance even more remarkable! The only part of the stamp I cannot guarantee my cat would do is to wear a Santa hat! Your new release is just what I needed to get my holiday spirit inspiration! Wonderful cards! Love the blacks and grays and whites of the santa card! Just stunning! All are amazing Chris but your Christmas cards are just STELLAR! Beautifully done! Can't decide which card I like best....maybe the cat first and Santa second....oh, I want them all! Darn you! Love the santa card. So special but mass producible! Your cards are perfect! Each and every one is unique. Thanks for the great giveaway! Wonderfully simple. Really well done. great cards, love the santa and bird cards! That star collage is fantastic ... so many possibilities ... and I love how you framed your adorable Christmas Cat. Love the star collage. So pretty. A wonderful set of cards that show-case the new release to perfection! I love your "Christmas Kitty" card and think the new Star Collage stamp is utterly fabulous! Thanks for the chance to win such a generous prize! Fabulous cards and just absolutely love the holly bird! Very pretty cards! I am loving the silver embossing on the dark paper. And, your car is so realistic- pretty card. Love the bird too- and the stars- cannot pic a favorite- love them all! I love that kitty card!! Absolutely LOVE background stamps. Looks like the star collage is one to add to my never ending list of gets! Awesome cards..I love the Holly Bird! Wonderful cards. I really like the one with the bird. Beautiful Cards! The Santa in Moonlight is so fun and the Star card is so pretty and different, and I love birds, so the bird one is on my list, too. Thanks for sharing. Beautiful cards! I am in love with the kitty stamp! Gotta have it! Love your cards! Enjoyed checking out your blog...I will be back! All of your cards are lovely! I am especially in awe of the cat one plus the Santa on his sleigh one. GOOD job! AND thank you Technique Junkies for the new releases and fun blog hop. Great set of cards but I especially like the "...to all a good night" card and quote--stunning. I may have to get that cross-eyed kitty stamp. :) Your bird card is fantastic! Beautifully crafted projects. Thanks for sharing your ideas. The blog hop is full of eye candy. It is hard to pick a favorite. I love them all! You are an amazing artist. The cat card is perfect. The coloring on the bird card is stunning. 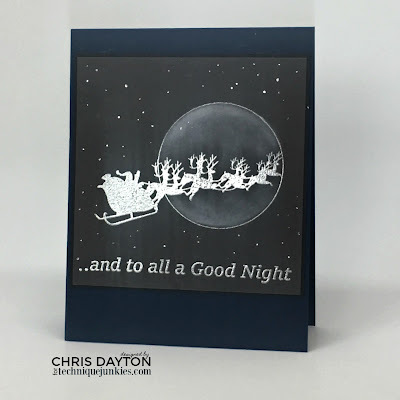 And the understated color scheme and interesting technique you used on the Santa's sleigh card makes it a winner!